Battle Flags, Etc.--Flags and information for patriotic, pro-gun, Second Amendment, pro-US Constitution Americans; 1835 Come and Take It flag; modern Come and Take It flag with Assault Rifle. Near wholesale prices for: US, state, national, & racing flags, NFL penants, custom flags; and more. Armed resistance to gun control. The Come and Take It flags highlight the philosophy of Battle Flags, Etc--Liberty or Death! and they illustrate our dedication to refuse any compromise of our Constitutional rights. fly this flag, Texas' first battle flag. again fly ole' Come and Take It. Come And Take It flag with a .50 BMG rifle! (c) 2002 DCT. Our newest flag, with an M14:;still used with devastating effectiveness by our armed forces, and an excellent sniper rifle! Come And Take It flag with an M14 rifle! 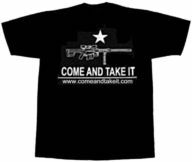 Note: We just reduced the prices of our Come And Take It flags, in time for TEA time, tax day rallies, etc. We are also hoping to better compete with the cheap flags printed in China. While we can't match their prices, our goods are 100% MADE IN USA with the HIGHEST QUALITY USA materials and labor! We don't sell junk or imports, or take advantage of slave labor from Communist countries. We love the USA, and we intend to do our part to keep the jobs here! Come and Take it Flags! United Nations (UN) Flags to Burn! Communist Chinese Flags to Burn! Police: transforming into the teeth of tyranny. Using instant checks to register/find gun owners. Our flags are featured in Chapter 27 of Robert Boatman's book, published by Paladin Press: Living With The Big .50. To buy the book, go directly to Paladin Press. Minuteman Report Survey: Whose Side Are You On?